I always liked the idea of having an advent calendar that wasn’t a cardboard one, or a chocolate one (much as I like chocolate advent calendars), but one with pockets or drawers that you can fill yourself, and would perhaps become a family heirloom. 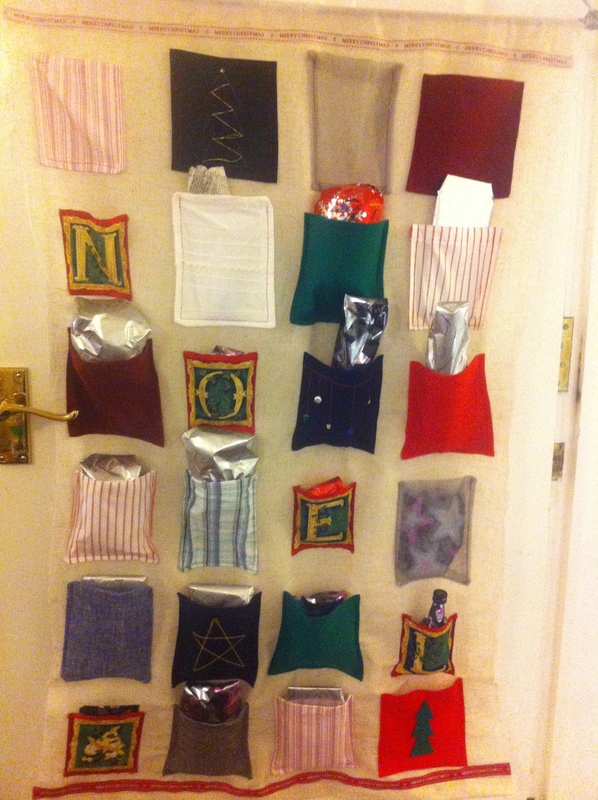 So last year I decided to make one of these advent calendars, and fill it for Marcus. I had a look around online for inspiration, and decided on a simple design with rows of pockets. This was shortly after I’d received the batch of fabric I got from freecycle, and I managed to make the entire thing out of the freecycle fabric, other than a couple of pieces of felt that I bought to make some red and green pockets, and some Merry Christmas ribbon to go along the top and bottom. 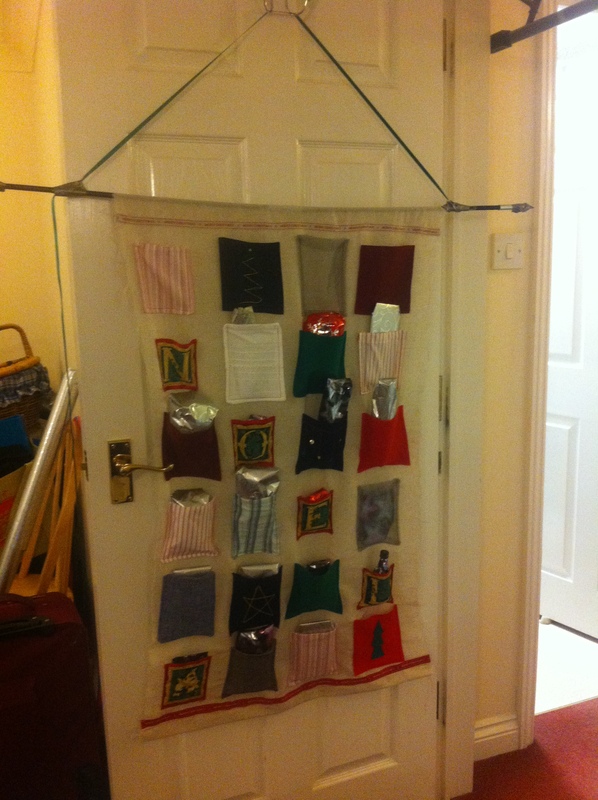 Included in my freecycle stash was a small strip of squares that spelled out Noel – absolutely perfect for the job! 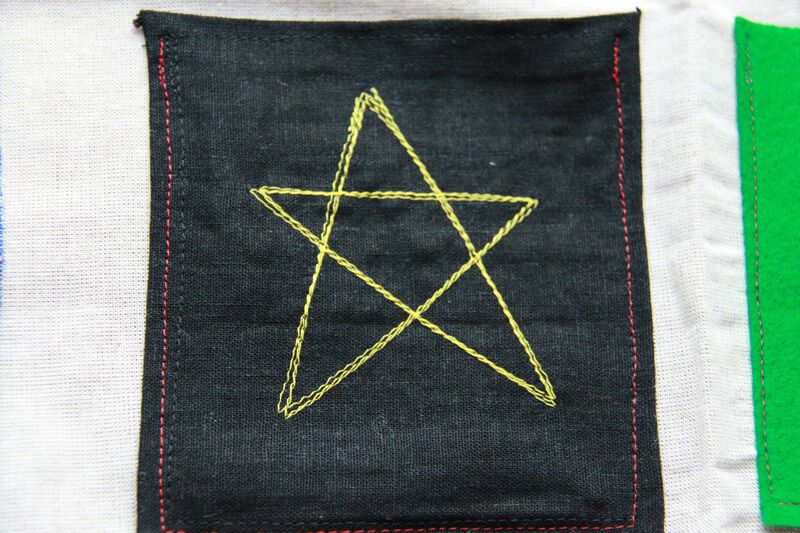 I made this fairly early on in my sewing days, and probably didn’t do as good a job as I could have done. I essentially just cut out each of the squares, folded under the edges and stitched them down (except for the felt, which didn’t need it), making a bit more of a proper hem on the top edge, and then sewed each pocket onto my backing fabric. 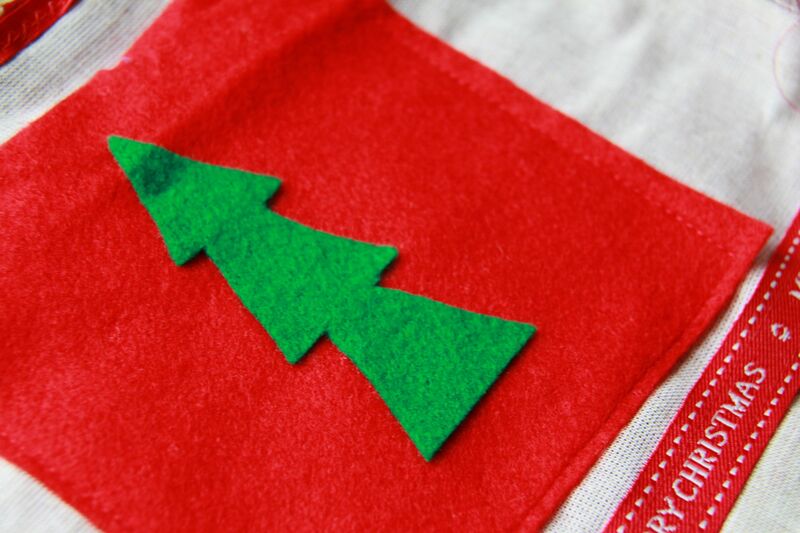 The Noel squares were a bit smaller than I made the rest of the pockets, and they also didn’t have enough leeway to turn in the top and the bottom edges. 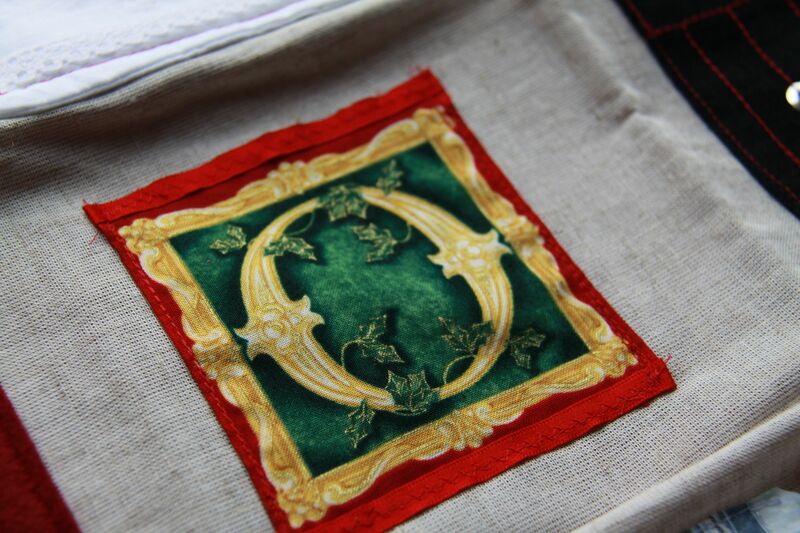 Instead, I sewed a strip of red ribbon along the edges on these squares. I did also have plans to knit a couple of the squares, but I only managed to get halfway through one before I ran out of time, so had to give up on that idea! 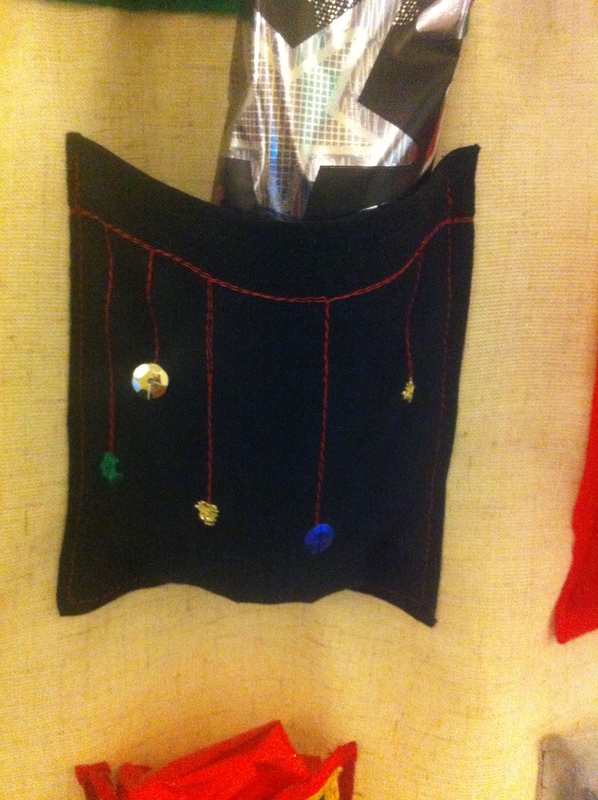 Some of the pockets I made a bit more of an effort with, and embroidered (I use that term loosely!) 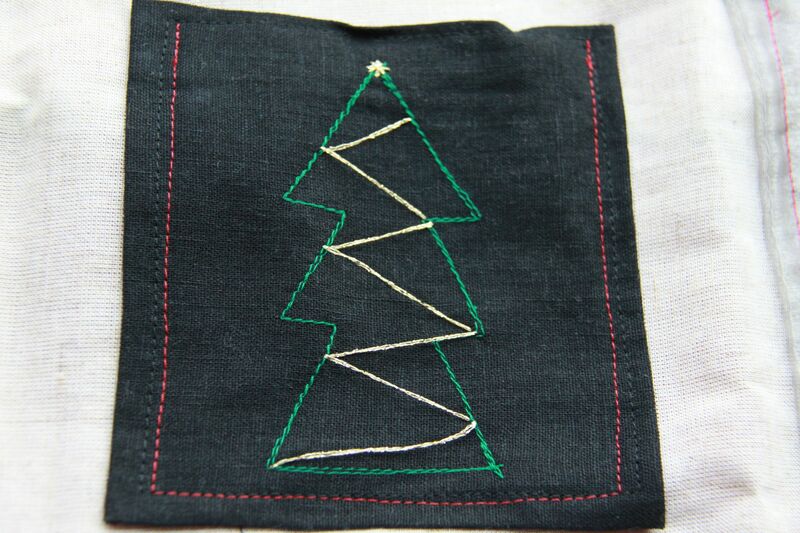 some Christmassy designs onto. 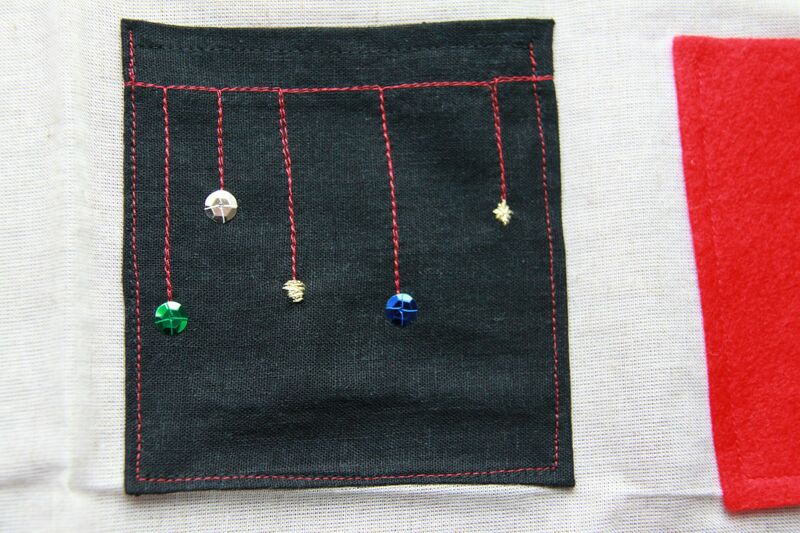 These are some of my favourite pockets, particularly the baubles one. I used some sparkly thread for some of them, which worked really well. I sewed over the designs two or three times, which made the colours stand out more, but I think also gives them a really nice ‘sketchy’ look. 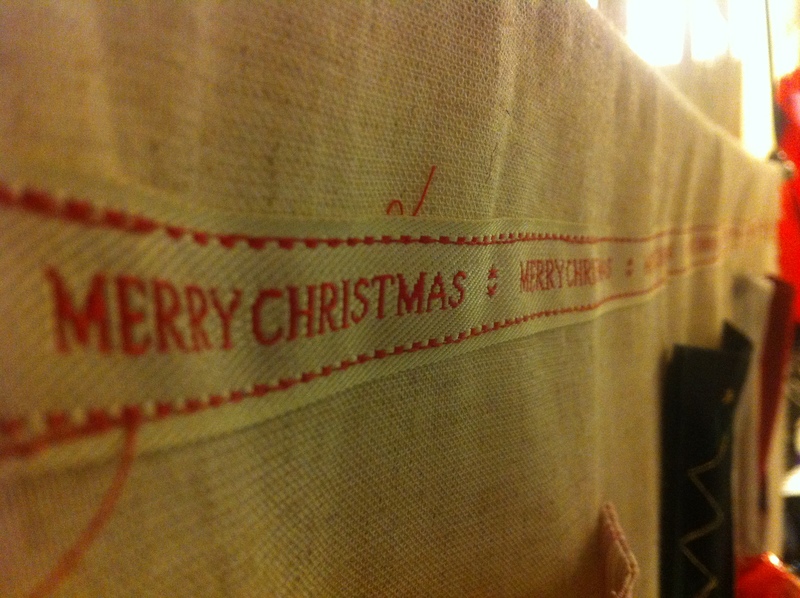 The backing fabric was a loose weave fabric, sort of like a light hessian, and it was perfect for the job. 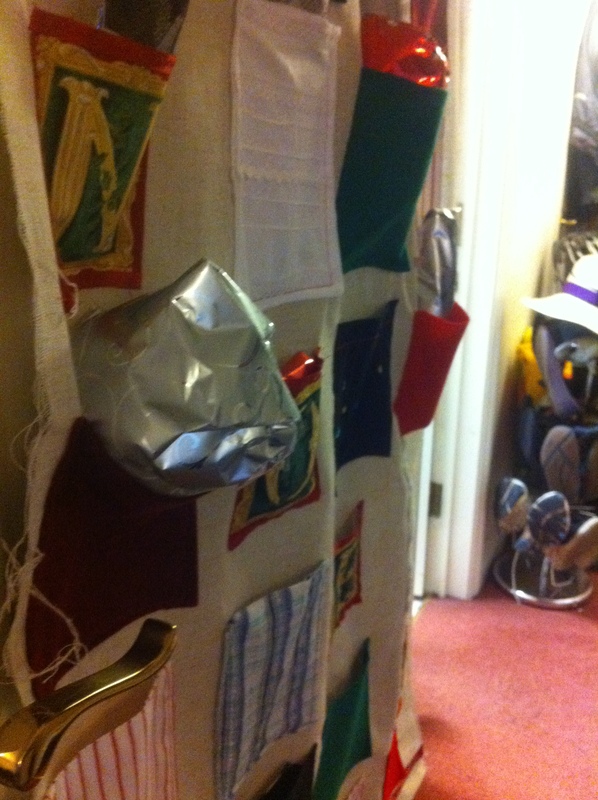 I folded over the top edge to make a tube, which I then threaded some spare tent poles through, so that I could tie ribbon onto the ends, and hang it from an over door hook. 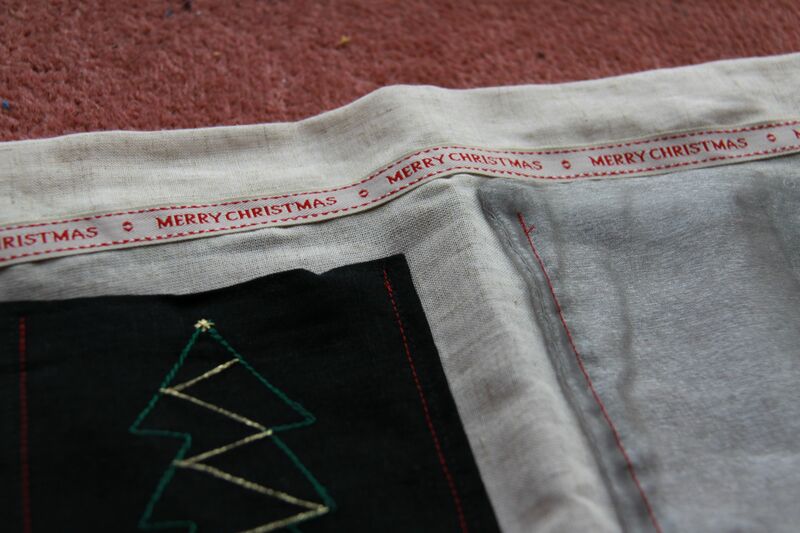 I also hemmed the bottom edge, and left the sides unhemmed, and I sewed Merry Christmas ribbon along the top and bottom. If I recall correctly, I cut it a bit fine time-wise and struggled to get it all finished before the 1st December, but just about managed it. 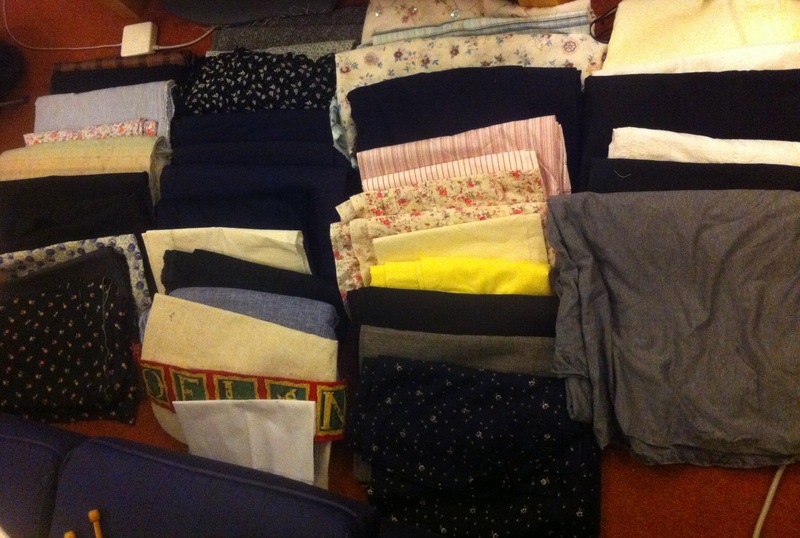 I also only just got it finished before my previous sewing machine decided to die on me. This year we are going to share the filling of the advent calendar, so I get to open some too – yay! When I suggested that we do half each this year, Marcus said that he had been planning on filling it for me, so we could take it in turns – how sweet is he?! :) But sharing makes it easier as well – I have to admit, it was hard work finding 24 things to fill it with that were small enough to fit in the pockets! Although it only gets used once a year, it’s nice knowing that we will hopefully use this for years to come.